Providing the best quality care for patients or loved ones, who have at-home medical needs, starts with finding the best quality comfort available to them. In order to ensure the greatest amount of relief and relaxation, consider investing in the newest high density, high resilience foam mattress model from Invacare: the Softform Premier Mattress IPM 1080. Patient Risk Level – With the new Softform Premier mattress from Invacare, you can enjoy a greater patient risk level accomodation compared to the Softform Excel. While the Excel model is only suited for patients with risk levels ranging from low to high, the Premier mattress raises the bar to accommodate patients with risk levels all the way from low to very high. Physical Features – For one, the construction of the new Premier model features a single-piece foam “U” core, which facilitates patient transfer by providing effective side-wall support. 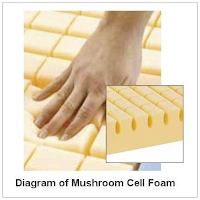 Additionally, while the older Excel mattress utilizes a “keyhole cut” for its HR foam insert, the Softform Premier foam insert uses a “mushroom cell” foam cut, which has increased comfort levels and greater support than the keyhole foam configuration. Lastly, the mattress cover on the Premier is manufactured with 4-way stretch and high-frequency welded seams - offering more durability and longevity than the Excel’s stitched seam cover. Warranty – Purchasing home medical supplies, such as a hospital-grade mattress, for personal, family or patient use is a big investment, so it’s only natural to be concerned about the quality and lifespan of the products you choose. The Softform Premier mattress comes with a comprehensive warranty, including 8 years of coverage for the foam and 4 years of coverage for the cover. The Excel mattress only guarantees 6 years and 2 years of warranty for the foam and cover. Clinically Proven Benefits Invacare’s Softform mattresses have been clinically proven to deliver essential benefits to patients, compared to users of traditional mattresses. In clinical studies, the Softform models reduced the prevalence of pressure ulcers from 34% to 7% whereas traditional mattresses only experienced decreases from 30% to 9%. 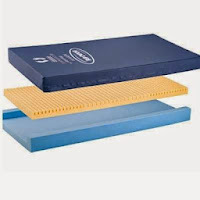 This top-of-the-line therapeutic foam hospital mattress, from Invacare, can start improving the quality of life of your patients and loved ones today. Save almost 20% off the list price, and receive free shipping when you order from PHC-online.com. Enjoy the long-term health and financial benefits of the Softform Premier Mattress IPM1080 by ordering today. Perhaps the most underrated of these is sleep. Sleep is not optional - our bodies cannot function without it and will eventually shut down with potentially fatal results. Sleep deprivation has a negative effect on many mental and physical functions and has been extensively used as an effective method of torture.